2005 in review: Happy New Year! 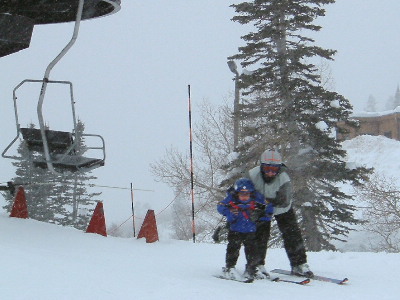 In January we went for our annual trip to Utah to ski with Karen's family. Greggy tried his first real downhill skiing and even went on the chairlift. And we enjoyed the usual fun of the outdoor heated pool and many games of bridge. Shortly after we got back, we were hit by a huge blizzard that buried our car and made for lots and lots of snow shoveling. 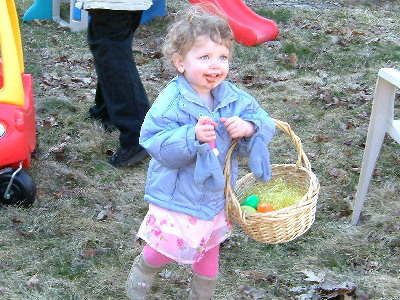 For Easter we decorated eggs with our friends Heather and Vlad and then had an easter egg hunt outside. 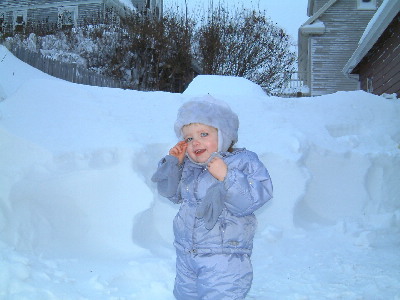 Since it was still March, we were still in our winter jackets but it was a lot of fun. 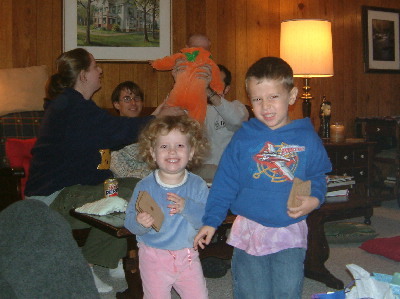 It turns out that Julia really, really likes chocolate. 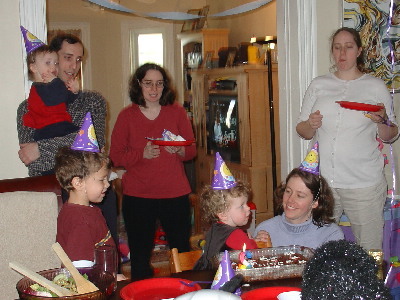 In April, we celebrated Julia's 2nd birthday party. She's been a real treasure this year. She and Gregory usually play really well together. We let them play together before 7 AM and often hear squeals of laughter as they play with their dolls, trains, and every now and then, run around naked. Julia is an interesting mixture of independence and neediness. The only thing that is predictable is that she wants to do it on her own terms whatever they happen to be! Luckily she's still snuggly and loves being hugged and read to in her big girl bed. Greggy also loves to be read to, and also likes to read to others. He even ran the storytime at his school one day and the teachers said it was very cute. 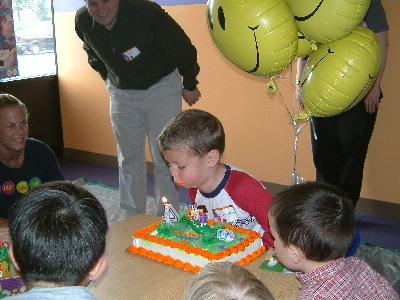 Birthday season continued with a huge party at Gymboree for Gregory's 4th birthday. Greggy had a blast because he got to play with all his favorite friends both from his school and from home. Karen's parents came for a visit in May where one of the highlights was when we went on a whalewatch. 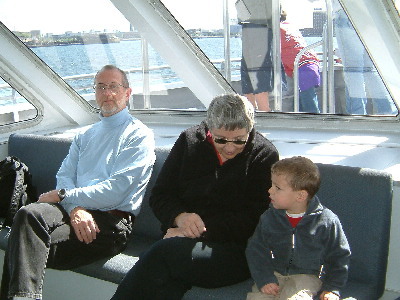 Gregory really enjoyed seeing the whales. 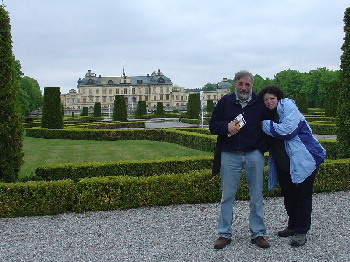 At the end of May we headed to Sweden to see Leo's Dad, who was working there for several months at the Mittag-Leffler Math institute. 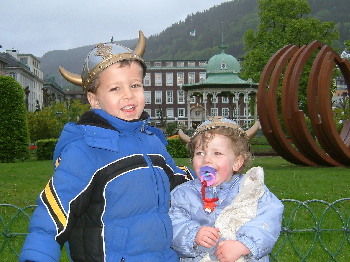 We also took a side-trip to Norway (back to Karen's roots!) 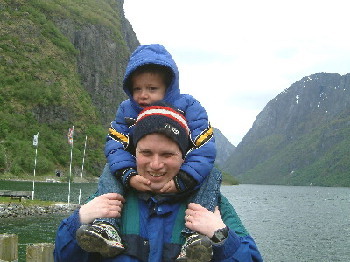 where we saw the spectacular fjords. This trip can't be expressed in only one picture, so here are a few. In July Karen went back to work full-time because she was promoted from a software engineer to a software engineering manager. It's been both challenging and rewarding. We also had some important birthdays and anniversaries this year so we enjoyed many family celebrations. Of particular interest is that Leo and Karen have been together for 10 years now! July 11th was the most important moment of the year when our niece Grace was born! Karen was lucky enough to be there for the big event. Barb and Jarrod live close by so we've been able to see them and pay back some of our babysitting debt. 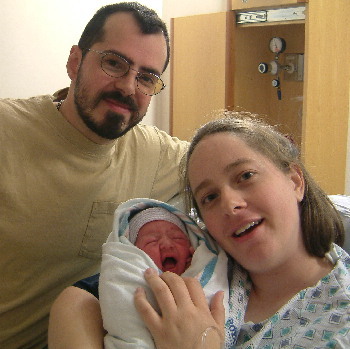 Gregory and Julia have loved having a new baby in the family. They've gotten very interested in dolls and like to feed, change, and push around their own little families. 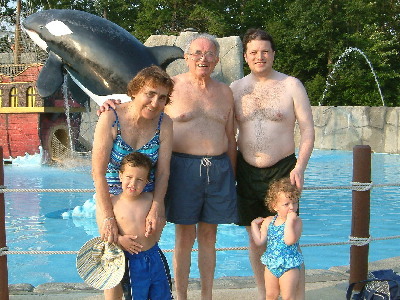 We went to a waterpark called Water Country last year and Gregory has been talking about it ever since so we made another trip up there with Leo's grandparents. Gregory went on some of the small waterslides and Julia's favorite part was getting eat a huge chocolate ice cream. Water Country! Have some fun! We realized that Gregory is going to be starting kindergarten next year and will be learning to ride a bike soon, so one big change this year was that we sold our house in Quincy and moved to a new house in Sharon. 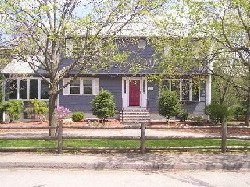 Buying the house took several months but we found a house we fell in love with and closed without a problem. Selling the old house was more challenging! We put some work into fixing the house (thanks to everyone who helped and a special thanks to Allison Dill who helped convert our purple kitchen to a neutral beige), and finally found buyers interested in our shared driveway. There was extra excitement when our buyers' mortgage fell through 2 days before the closing but after a slight delay, everything worked out fine. 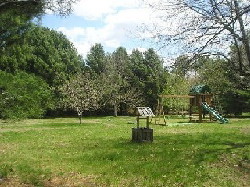 We now live on a quiet side street right next to the elementary school and only 2 miles from Leo's parents. We commute to work on the commuter rail which takes a bit over an hour door to door but at least we get to read and relax on the train. In September Karen's Aunt Linda came for a quick visit. 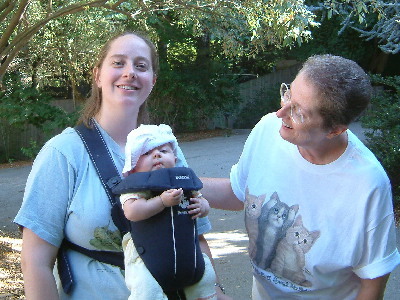 One day we all headed down to the Roger Williams zoo. Karen also took a day off work and went to Six Flags with her cousin Jimmy. It was really fun and very reminiscent of high school adventures. We decided to take a fall cruise to Bermuda (and no, I didn't accidentally leave this section in from last year - it was just so good that we had to do it again!) We convinced Karen's parents, Barb, Jarrod, and Grace to come with us, along with Leo's grandparents and sister who had come last year too. It was a lot of fun, as we knew it would be. 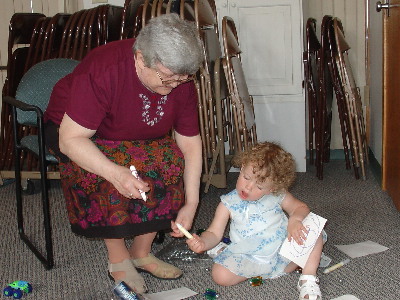 After we got back from Bermuda, the kids started in their new preschool here in Sharon. Before that we were still driving to the Quincy school every day which was not fun in rush hour. They've adjusted very well to the new school and made friends quickly. The kids had a fantastic Halloween. 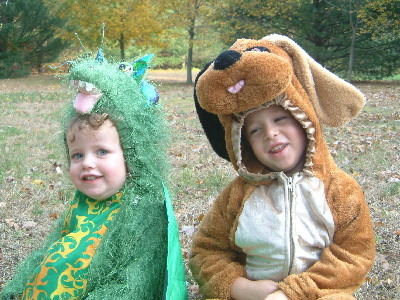 Gregory was a doggy and Julia was a dragon. We trick-or-treated up and down our street and the kids got a bunch of candy. I don't know if it means we are good or bad parents that the kids have only eaten a single piece each (and no we didn't eat it either - it is just sitting forgotten in our pantry). We celebrated Thanksgiving in Connecticut with Karen's family and got in our usual family bridge games. According to the teachers, this year Gregory was thankful for... his sister! Awww, isn't that cute? Santa Claus is a big hit with Gregory. What we don't understand is that when we tell him about practically anything else (the immune system, what different emotions are called, etc) he has tons of questions. But when we told him that a large guy with a beard and a red suit was going to fly with reindeer to our vacation house in Canada from the North Pole and leave him exactly what he wants, he didn't have ANY questions and accepted it happily. Perhaps his excitement for presents overruled his curiosity. We had a little party with Nathan and Bridget where we made and decorated ornaments and Christmas cookies. Karen managed to only eat half the cookies. Well, maybe 2/3rds, but the kids got at least 2 each so fair's fair. 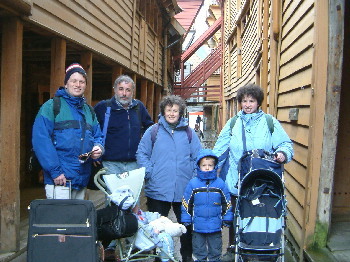 We celebrated both Christmas and Hanukkah up in Magog, Canada where we went cross-country skiing with Leo's family. Greggy amazed everyone with his super skiing abilities and both kids were thrilled with the digital cameras that Santa provided. 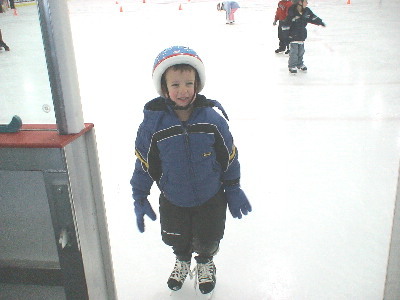 Gregory's also been learning how to ice skate which is amazingly cute. Thank you for sending us so many holiday cards this year! We love getting them. We hope all of you have a fabulous year to come and will keep us up to date on all your activities! Please come and see us when you can.